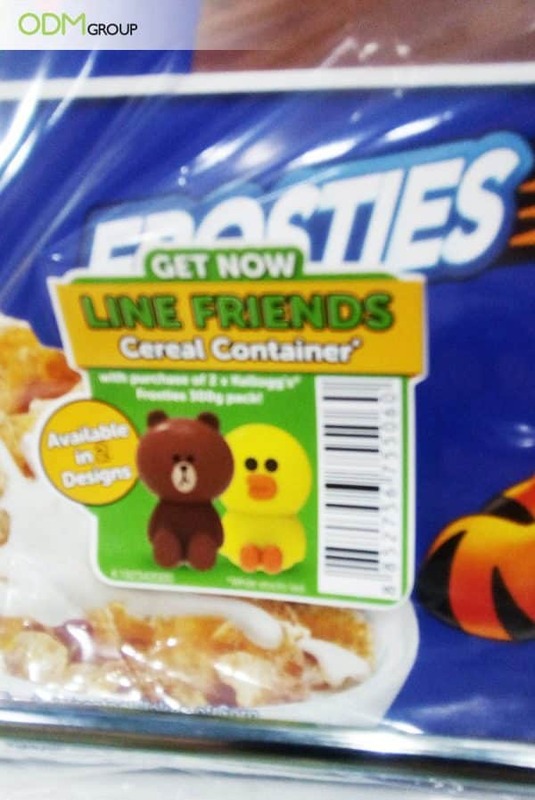 Kellogg’s is offering LINE friends cereal containers for every purchase of their Kellogg’s Frosties. This GWP merchandise promotions is effective in promoting LINE messaging app as well as Kellogg’s to those who haven’t tried their cereals. The cereal containers come in two different designs: Brown and Sally. At first glance, they look like figurines but the top part serves as the lid that customers can remove. Not only an customers use it to store their breakfast cereals but it also works as an excellent kitchen decor. The versatility and the uniqueness of the promo gift are what make this promotional campaign a success. What Makes Kellogg’s GWP Merchandise Stand Out? Design Appeal: Versatile and pleasing to the eyes, the cereal containers are definitely something kids would want to have. 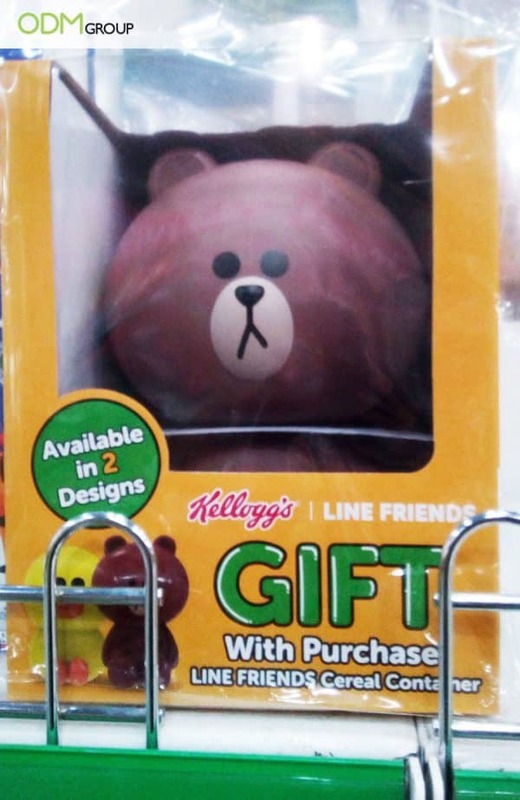 LINE users will also be inclined to buy the cereals because of the unique gift with purchase merchandise they’ll receive. It’s effective because customers like unique and useful products that they can’t get from other brands. Practicality: High-utility products are a great marketing giveaway because people want something that they can use every day. Kellogg’s gifts are valuable in that they can be sued to keep cereals, cookies, nuts, and candies. And, with every day use, customers will keep the brand on top of mind. Exclusivity: By including exclusive LINE merchandise, Kellog’s is basically telling their customers that their products are worth collecting. and because the products are available at a “limited time” only, shoppers are would be more willing to buy now for fear of missing out. 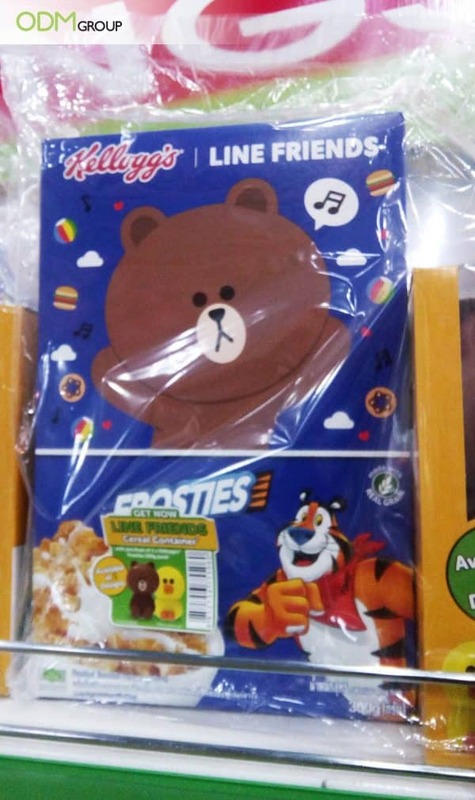 Engaging: Kids will definitely love these cute cereal containers and this is a good motivation for kids to not skip their breakfast. So not only are these containers practical, but they also spread positive message. As business owners, you want your customers to be coming back to your store or to support your brand. And what better way to inspire customer loyalty than giving them practical ad unique gifts that other brands can’t offer? That is why, we came up with super easy tips to help you improve your own GWP merchandise campaign. Make it Relevant: Your promo giveaways should be related to the product / services you are selling/offering. In this case, Kellogg’s cereal containers. If your main products are cosmetics, it makes sense to include gwp toiletry bag or custom cosmetic pouch that customers can use to store their beauty items. If you’re in the alcoholic beverage industry, a gwp beer glass or custom jiggers would be your best options. Custom Design Them to Reflect Your Brand’s Core Values: In order to grow your business, it is necessary to communicate your message and what you strive to deliver. Why is this necessary? This is in order to remind customers that you are there for them. Take a look at this custom sand timers. Ideal as customer incentives, on pack merchandise, or corporate souvenirs, you can use your logo and company maxim to further brand engagement. Indeed, Kellogg’s was able to satisfy the needs of the customers by providing complementary gifts that they can use to keep their cereals taste great and in good condition. In addition, customers enjoy the thrill that comes with receiving free item with every purchase. This also give them reasons to look forward to your next free gift campaign. Before you start your GWP merchandise campaign, know your promotional product options. Here, at The ODM Group, we specialize in designing, sourcing, and manufacturing of promotional products for your company. Speak with our designers and merchandisers today! Looking for more marketing inspiration? Here are some of our favorite blogs about GWP merchandise. Gifts with Purchase Merchandise to Give Your Brand a Boost! Bluetooth speakers are becoming popular nowadays, thanks to the emergence of music streaming sites. People can now stream music on demand, for free. With that said, a bluetooth speaker will definitely make great gwp item for tech companies and employee appreciation. Great gift with purchase for casinos, lottery outlets, aswell as game centers, these lottery scratcher key chains are small but useful. Card holders are fashionable and useful item, making them ideal gifts with purchase along with men’s and women’s accessories, apparel, and more.